The Atlas has a stylish, modern design with many useful features including delta handlebars, wing mirrors, LED lighting system, and front basket. It can handle an incline of 15 degrees. Price excluding VAT.(Incl. VAT £4,794) *VAT Relief available on this product. The Atlas mobility scooter has powerful twin motors along with many useful features making it a sheer joy to ride. The control panel is laid out in a simple fashion so that you’ll be able to see battery life, change speed settings, and activate the LED lights instantly. Delta-shaped handlebars will provide more options on where to place your hands and rest your wrists. For comfort, there is a Captain’s style seat which can be fully adjusted to suit your needs. It will provide excellent comfort for your back and head, so you can tackle those longer distances. 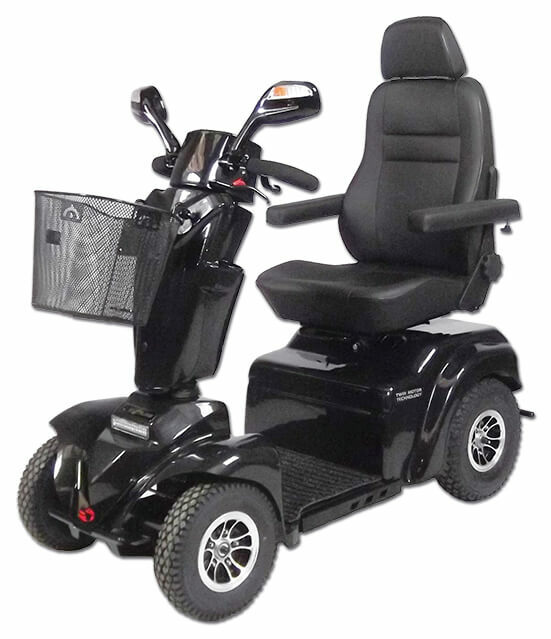 The lift-up armrests give you the option to side transfer without any obstructions. The Atlas has been built with rough terrain in mind. It can easily cope with an incline of 15 degrees while still offering a smooth ride thanks to the all-round elastomer suspension. Bright LED lights and large wing mirrors will help you to stay aware of your surroundings and drive in adverse weather conditions. There is a handy front basket to keep items in when out and about. These scooters are made using ABS color-through plastics which won't chip or peel and are therefore easy to maintain. Also available are extras including front baskets & holders, rear trolley baskets and crutch holders.